We’d love your help. Let us know what’s wrong with this preview of The Quest of Dai by Vivian Marie Aubin du Paris. To ask other readers questions about The Quest of Dai, please sign up. What would you do if when you woke up in the morning, you were in another world? A world where you didn't know the rules. A world where dangers lurk in every corner. And then you find out that you are the key to saving this world and you need to pick a side. This is what happens to Diamond "Dai" Gold. When the story opens, she is going to prom with her best friend and a hunky date. After prom, they go to a cabin in the woods and she goes to sleep. The next morning she is in a different world. 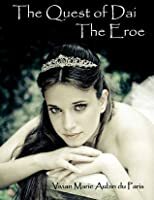 There she meets the Eroe, a group of warriors who have many different talents. And they are all CUTE! She is dressed in silks and satins just like she was a princess. Adventure takes over and Dai finds herself in many dangerous situations where she is rescued by a boy who she finds irresistible - Westly. Now she has to decide who she can trust and who to love. This was a good book but is very long. It reminded me a lot of TWILIGHT, in that it has the adventure and the romance. This would be a great book for a hot, lazy summer day. So read it and escape into the world of Dai and Westly. A thrilling fantasy adventure with just the right dash of humour and romance. Well worth a read, and at an epic 400 pages, definitely good value for money! Vivian Marie Aubin du Paris lives in Lakewood, WA with her husband, a lovely cat named Lady, and within a mile of her parents and sister. She is a young adult author prone to giggling, downing large quantities of Coke, and spending countless hours on the computer.